I should not have read this book so soon after having read the Violet Eden series by Jessica Shirvington. It was hard not to compare the two, at least in the beginning. Once I got into the story it was easier to distance myself from Violet. 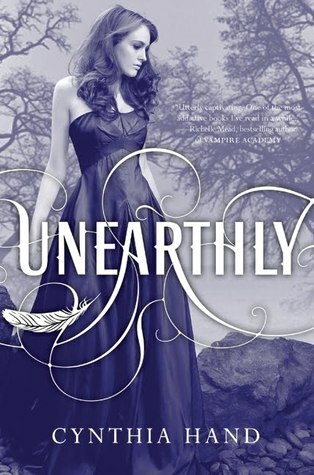 Yes, there is a love triangle in Unearthly, but it's not nearly as prominent and is not as "torn in two directions." At least not until the last hundred or so pages. I liked Trevor right off the bat. He was snarky, confident, and... yummy. At first he seemed like he was going to be the bad boy, but once we saw more of him, he really turned out to be a perfect gentleman. He is "the type of guy most mothers would love their daughters to date. He's respectful, polite, even downright chivalrous" (371). That's not to say Christian is a jerk. Okay, there was that one incident, but you'll get there. He's described as a god and every girl has some sort of obsession with him. I get it, and he's nice enough, but... that's it. We spend sometime with him, but he spends a majority of the book in New York City, so we really get to see more of Tucker's personalty than Christian's, but I have a feeling that will change. I did enjoy the "triangle" between these two. It was a lot of fun to this their relationships developed. I really liked that it wasn't a instant love-thing either. The relationships were gradual and slow. I'm very interested to see how this is going to play out in the next few novels. I liked Angela a lot and wished we could have seen more of her, same goes for her brother. I won't give away too much, but what happened to him?! An issue I do have with the book is that nothing happens. Ninety-percent of the book is Clara living out her day-to-day life. She goes to her new school, makes two friends (or four depending on how you look at it), summer comes, and she tries to put the pieces of her purpose together, and (kind of) learn more about the mythology of angels. I wish there would have been more action... until I got to Chapter 20 (page 387). I could not put the book down once I got to this point and everything prior was completely worth it. (I wish I could give more details and to what happened, but it was be pretty spoilery.) I got the action I was craving and more! And the plot twist? Wow. I was yelling expletives, with a few "I can't handle this" bursts. I understand why the first hundred pages were the way they were now. Don't get me wrong, they were good, well worth the read, and I definitely enjoyed them. I feel like these pages also allow the sequels to be more jammed packed. We already know back stories, purposes, and a few angel tidbits, which gives Clara's mother to opportunity to spill her secrets and stop being so hush-hush! Sorry, it just annoyed me as much as it annoyed Clara. Her mother was so secretive! I get the one secret she kept, but the rest of them?! Tell me already! I cannot wait to get to the sequels and find out what's going to happen, especially since I already read the blurbs! Too many novels, too little time.